Today I decided to do a full Core order of ritual with a gate opening, meditation, and then formal closing. What a difference the opening of a gate and offerings makes to the power of the meditation. I really felt the gate open and the shift in the flow of the energy in the room. I kept the offerings simple, just some stick incense for each of the kindred. I didn't invoke specific deities, spirits or dead. I just let come what may. After the gate was opened I did the charm of second sight from Ian's book. I didn't get a clear view of the energetics around me, but I did get an impression of the gate open over my alter. I could feel the energy flowing into it, like the softest of winds. It wasn't long before I felt pulled out of my body into the spirit world by none other then the morrigan. She had some things she needed to address. I won't share all of it, but one thing that really sticks with me is she led me to a battlefield. There I watched what can only be described as butchery. She asked me which army is "right"? Which one has the moral high ground. As I had no context for the battle, no reason for it, I could only tell her that I can't tell. Therein seemed to be the point of the exercise. Deciding what is "right" or "wrong" action requires knowing the context in which the action takes place. When I look at it, really look at it, I see that action itself is purely neutral, neither right nor wrong. If that's so, then what do we mean when we say we judge people by their actions and not their words? It seems to me what we are really saying is we judge their actions within the context of the situation. Yet, how do we know we really understand the context? So much of what we think we understand, we don't. One crucial piece of missing info can totally shift your perception of ones response to a perceived situation. In the end we can never really know all the parts of a situation. We can only operate on a best guess basis. 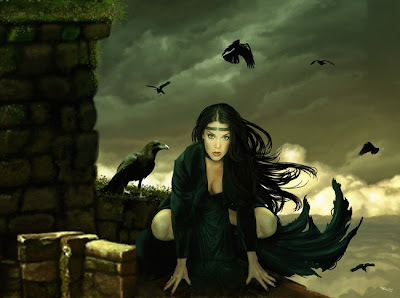 It was also made clear to me that the reason the Morrigan is the queen of all things is because all things die, and she is the great devourer, she is also bearer of the ripe fruits of spring, and the scythe wielder in the harvest season. thank you brother for posting this vision. i needed to hear this from someone i love. yes, one crucial piece of information can shift a perspective, drastically and typically that particular piece of the puzzle is the one that is most hidden, secret and/or obscure.